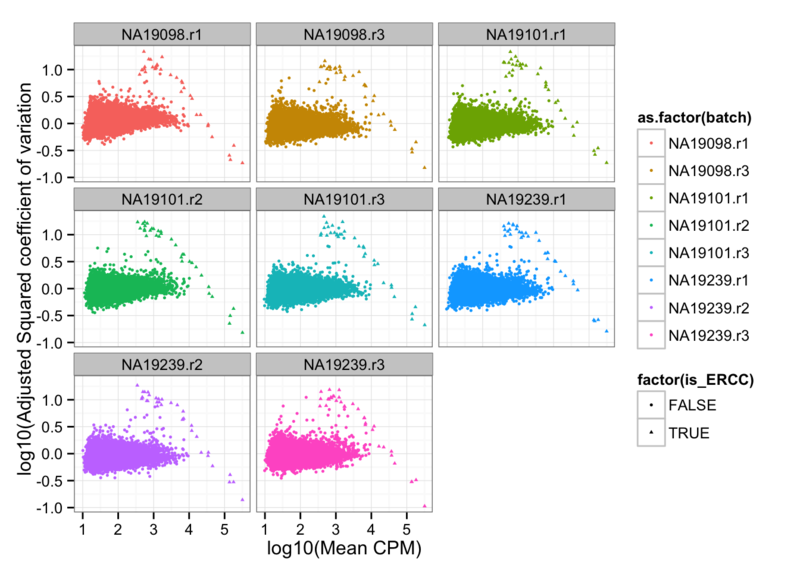 We would like to compare coefficients of variation of gene expression across individuals, a metric that is widely employed for quantifying heterogeneity of gene expression in single cell sequencing data. Setting the discussion of heterogeneity aside, the major challenge associated with the analysis of coefficient of variation resides in the nature of count data having high coefficient of variation at the low count level. 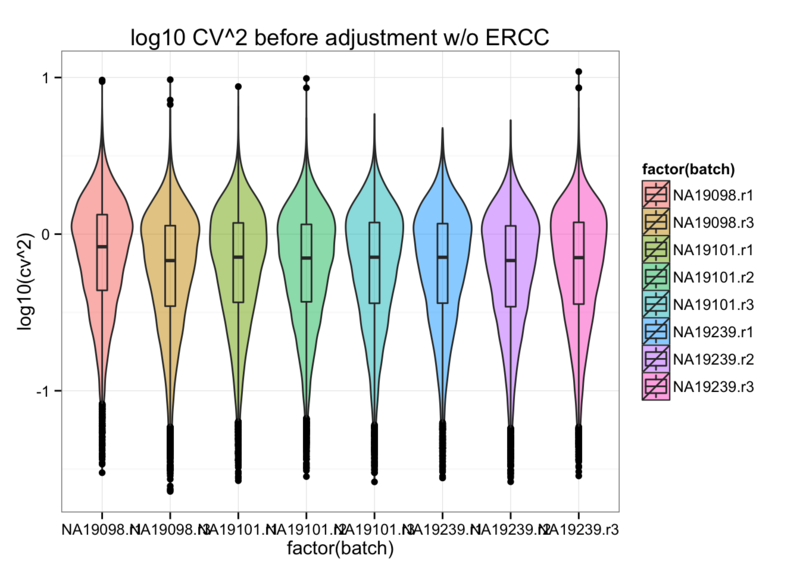 We verified the mean-CV relationship in the scatter plots of per gene coefficient of variation across cells versus mean molecule cout across cells, for each individual samples and across all samples. Kolodziejczyk et al. 2015 surveyed the transcriptome profiles of mESCs cultured in three different conditions and propose DM (distance-to-the-median), a corrected version of CV that is independent of the mean, as a metric of heterogenity comparison. They followed the analytical strategy in Newman et al. 2006. In this document, we adopt the same strategy as in Kolodziejczyk et al. when removing the dependency of squared coefficient of variation on mean molecule count per gene. These “normalized” squared coefficients of variation will be used in all downstream analyses of cell-to-cell heterogeneity individual differences. Our results indicate that after this normalization step, the coefficient of variations no longer has a polynomial relationship with mean gene molecule count. 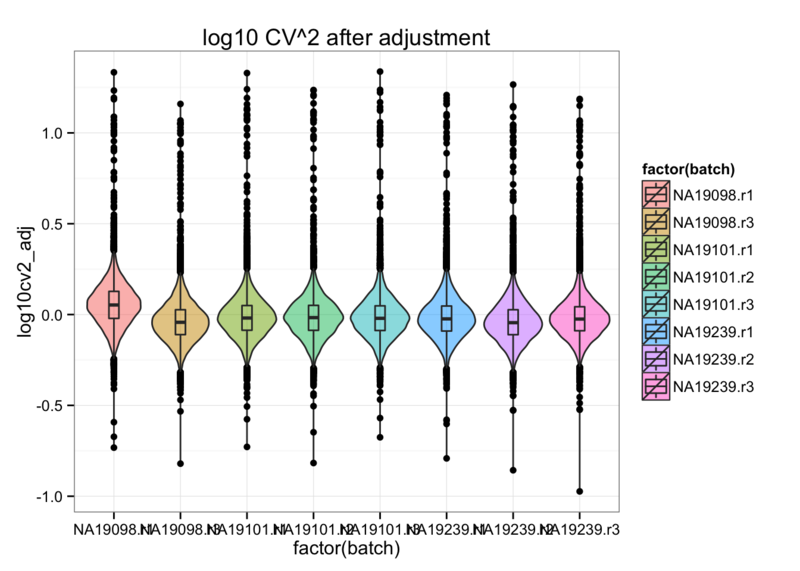 where ϵgk is independent distributed as a normal random variables for each gene g and sample k, and CVg2 is modeled as a smooth function of μg, the mean molecule count for gene g.
Input endogeneous gene molecule counts that are QC-filtered, CPM-normalized, ERCC-normalized, and also processed to remove unwanted variation from batch effet. ERCC genes are removed from this file. Input ERCC gene moleclue counts that are QC-filtered and CPM-normalized. Combine endogeneous and ERCC genes. 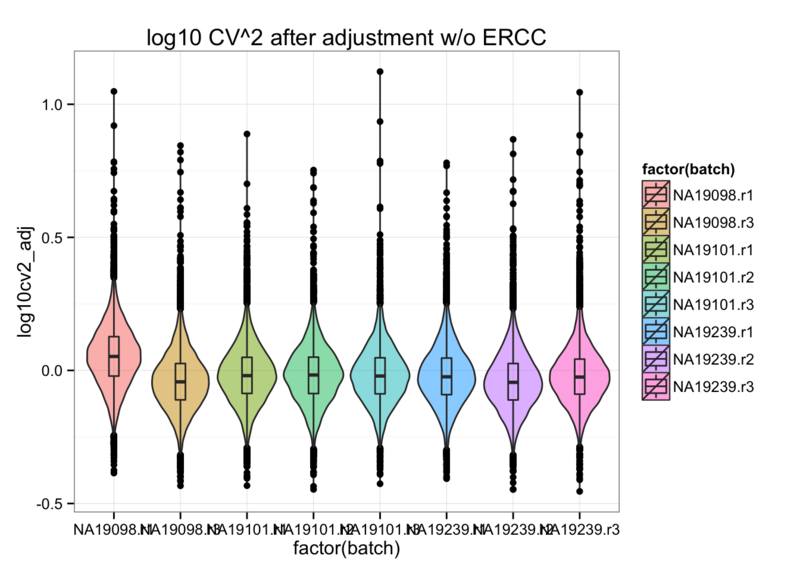 Input endogeneous and ERCC gene moleclule counts before log2 CPM transformation. This file is used to compute percent zero-count cells per sample. "ERCC-00131" "ERCC-00136" "ERCC-00145" "ERCC-00162" "ERCC-00165"
Compute per batch coefficient of variation based on transformed molecule counts (on count scale). Include only genes with positive coefficient of variation. Some genes in this data may have zero coefficient of variation, because we include gene with more than 0 count across all cells. *This method was designed for comparison of variation profile across genes, while we are intersted in comparison of heterogeneity profiles on a per-gene basis. In studies that count reads instead of molecules, gene length is a possible confounder in expression levels. However in our study, UMI is used to count the number of RNA molecules in each cell. Hence, we may not need to adjust coefficient of variation for correlation with gene lenght. Compute rolling medians across all samples. We aggregate normalized molecule counts across samples to compute sample-wide rolling medians. Specifically, we ordered data-wide coefficients of variations according to their corresponding values of molecule counts. Then, we take rolling medians of the ordered coefficients of variations, using the same parameters in Kolodziejczyk et al. 2015: the number of genes in each window is 50, and the number of genes that overlap between windows is 25. Finally, we substract data-wide rolling medians of CVs from each sample’s CVs. Sanity check for the computation of rolling median. 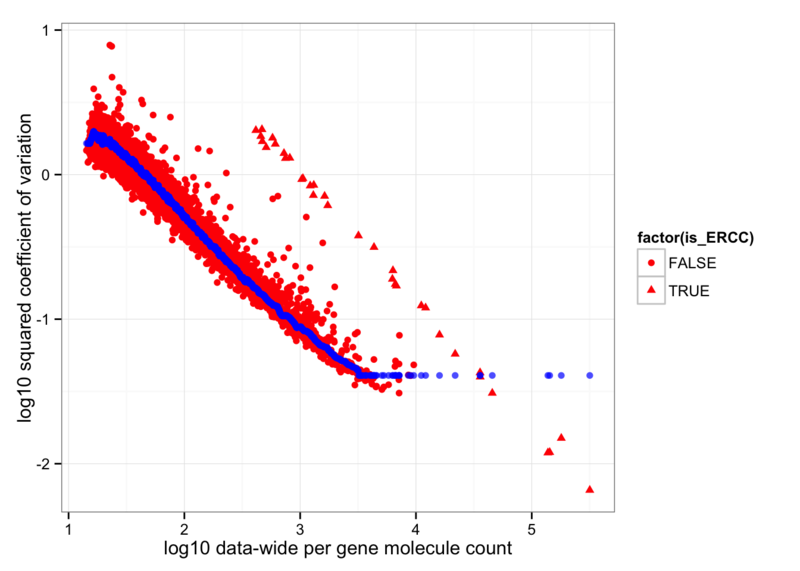 Compared to data before normalization and transformation (link), ERCC gene mean molecule counts are higher than endogeneous molecule counts after normalization and transformation. Compute adjusted coefficient of variation. 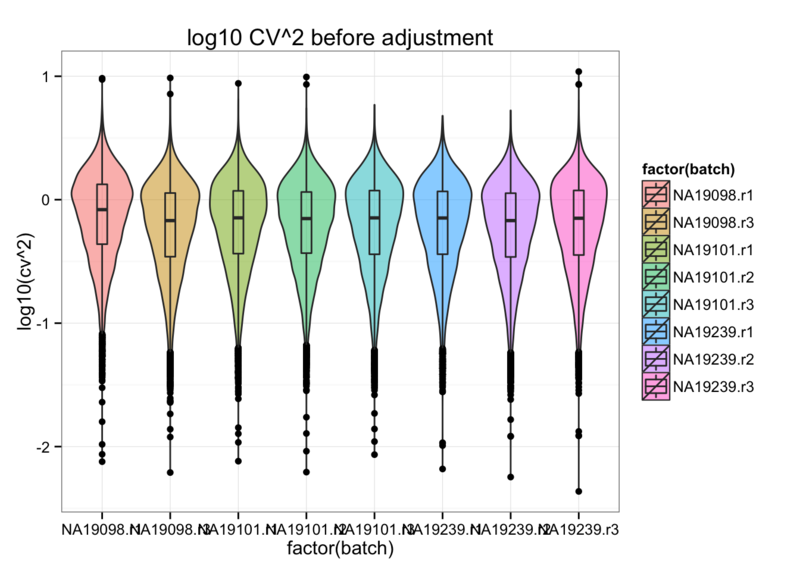 Adjusted squared coefficient of variation versus log10 mean count (CPM corrected). ERCC remain the outliers after substracting out rolling medians. All genes: coefficient of variation after adjustment. ..- attr(*, "class")= chr [1:2] "element_text" "element"
- attr(*, "class")= chr [1:2] "theme" "gg"
All genes: coefficient of variation before adjustment. Endogeneous genes: coefficient of variation after adjustment. Endogeneous genes: coefficient of variation before adjustment.